Many years ago, Jamar Mozee was a driving force for Blue Springs football, a star running back that helped lead them to several big wins. Tonight, as the head coach of Lee’s Summit North, Mozee was on the opposing sideline for a big win. A win, in fact, that made history. 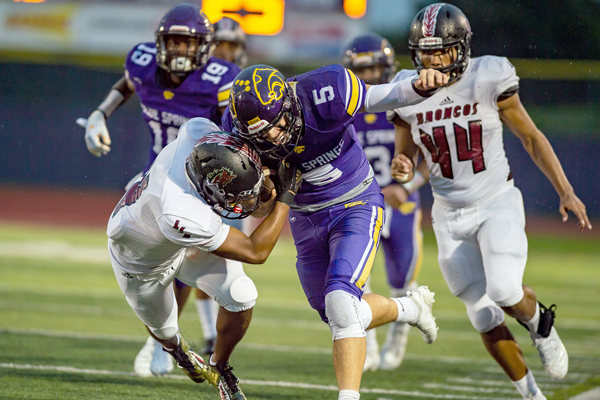 The Broncos had tasted defeat all 20 times they had played Blue Springs in program history until tonight, as they won a thriller, 28-27 in overtime. Was this the biggest win in school history? It’s hard to argue with him. The Broncos bolted to No. 4 in the Class 6 state rankings, and they’ve now got a signature win under their belt. It wasn’t easy. Against Blue Springs, it never is. After a slow first half that saw the Broncos lead 7-0, things started to pick up in the second half. North went ahead 14-0 on a 30-yard touchdown run from Keyon Mozee, when all of a sudden, Blue Springs’ offense flipped a switch. They stuck with their ground game and started to wear Lee’s Summit North’s defense down. They put together a 14-play, 65-yard drive - all runs - that was capped by a 3-yard quarterback sneak touchdown from Koby Mansfield. The two-point conversion made it 14-8. Several of the plays on the drive were quarterback sneaks, as he was getting 4-to-6 yards on each one. On its next two possessions, Lee’s Summit North would cough the ball up. One a fumble on the snap to Carter, another on a bad snap to the punter that set Blue Springs up on the Bronco 10-yard line. Both times, Mansfield capped the drives with quarterback sneak touchdowns for a 21-14 lead midway through the fourth quarter. After Mozee had a punt return for a touchdown called back, the Broncos had the ball with two minutes, 29 seconds left and 68 yards to go. All game long the Broncos had relied on their running game and trio of playmakers - Ontario Russell, along with Mozee and Carter - throwing just a handful of passes, partly due to the wet conditions. But with the game on the line, it was a screen play from Carter to Russell that tied the game at 21-all as Russell got to the outside and found the end zone from 42 yards out. It only seemed like a matter of time before the Broncos broke a big play. The Broncos got the ball first in overtime and stuck to what they do best, mixing in a little bit of each of the three-headed offensive monster before Carter found the end zone from 3 yards out for a 28-21 lead. Blue Springs answered in similar fashion, as Aveion Bailey scored from 8 yards out to make it 28-27. To the surprise of Mozee, Wildcats head coach Kelly Donohoe decided to go for two and the win. Mansfield took the snap and bumped into his fullback before being taken down behind the line of scrimmage and preserving the historic win for the Broncos. Finally, the streak was broken. Lee’s Summit North (3-0) will host Park Hill next Friday, while Blue Springs (1-2) will travel to Lee’s Summit.